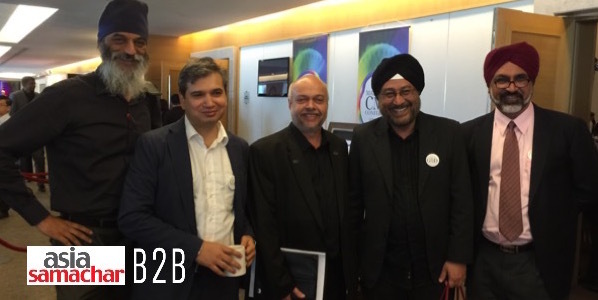 Regional marketing and advertising expert Harmandar Singh and and his team held a successful marketing seminar in Kuala Lumpur on April 21. The 4th Malaysian Chief Marketing Officers (CMO) Conference attracted some 300 participants from the agencies, clients, media houses and marketers side. Ham, as he is popularly known in the industry, is the founder and owner of marketing communications publisher and event coordinator firm Sledgehammer Communications (M) Sdn Bhd, which publishes the Marketing magazine. It used to publish ADOI. Some B2B networking — aka the bhai-to-bhai kind — was seen taking place as well. Spotted at the event were Ir Nirinder Singh Johl, a general manager at Malaysia’s national power company Tenaga Nasional Bhd (TNB). Also seen were Ipsos Business Consulting country head (Malaysia, Singapore and Philippines) Kiranjit Singh and technology news portal Digital News Asia (DNA) founder/CEO Karamjit Singh. Asia Samachar had managed to get them to pose together, along with fellow participant Multimedia Development Corporation (MDEC) vice president Michael Warren. The CMO conference had lined-up 30 speakers and panellists. Leading the charge was Malaysian-born SY Lau, senior executive vice president of Tencent & president of its Online Media Group (OMG). He was recently awarded Cannes Lions 2015 Media Person of the Year award. Globally known as the WeChat Company, Tencent is the largest internet service provider in Asia, with a market capitalisation of US$204 billion. READERS: If you are at an event with at least another Sikh, capture the moment and email it to us at: asia.samachar@outlook.com. Make sure you provide us full details and a contact number.